As reported in Space.com on Monday, Feb 27, SpaceX founder Elon Musk announced that the company will fly two private citizens around the Moon in 2018. The private spaceflight company will use its Falcon Heavy rocket to send the two paying passengers into space aboard one of the company’s Dragon spacecraft. The two private citizens, who have not yet been named, approached SpaceX about taking a trip around the moon, and have “already paid a significant deposit” for the cost of the mission, according to a statement from the company. The names of the two individuals will be announced later, pending the result of initial health tests to ensure their fitness for the mission, the statement said. 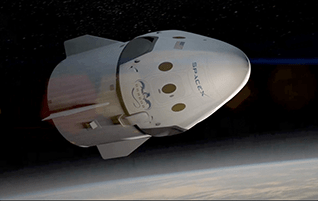 Event Thu 4/13: Emerging Opportunities in Commercial Space -or- Forward… into the Past!